What is it with cats and quilts? I left the quilt on a chair after sewing in the evening. In the morning I found the cat had already colonised it! Dogs know who is boss but cats make their own rules. When I photograph a quilt the quilt guard is a necessary assistant. They just can’t help themselves, any quilt is fair game for them. 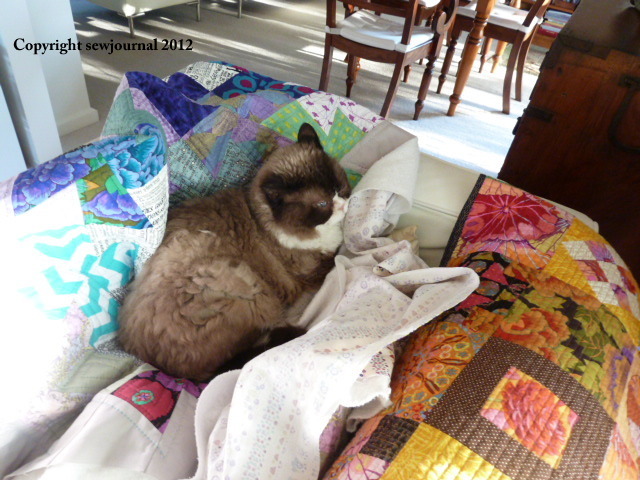 I usually keep the quilts I am working on shut away so my cat doesn’t “fur” it. They have to make sure the proper number of cat hairs have been applied. I think you’ve got it Pat!